Rigid Expanding Foam (Parts A & B) - Industrial Plasters Ltd.
An easy to use Rigid Expanding Foam, it is a low density, rigid foam system which may be used to manufacture mouldings. It is also suitable for structural infill of fibreglass components, and relies on the thorough mixing of two low viscosity liquids by either hand or machine mix techniques. 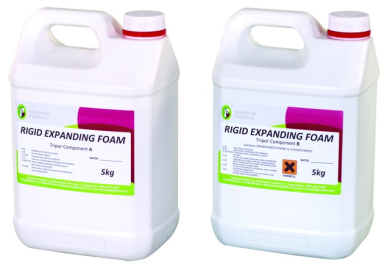 The foam is produced by the mixing together of the two Components A and B at a ratio of 1 to 1.06 by volume, or preferably 1 to 1.2 by weight - however it can be mixed 1:1 for ease of use. 1kg of mixed part A & B expands to approximately 1 cubic foot. This product contains no CFC's or HCFC's and therefore has an Ozone Depletion Potential (O.D.P.) of zero.